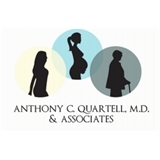 Anthony C. Quartell, MD & Associates (Livingston) - Book Appointment Online! The practice of Anthony C. Quartell, M.D. & Associates is dedicated to providing for the special health needs of women of all ages, whether they are just entering puberty, expecting a baby or traveling through menopause. Our warm and professional staff are trained to provide the highest quality of care to our patients, including adult and adolescent gynecology, gynecologic surgery, and obstetrics. We offer comprehensive care for healthy women as well as patients who are experiencing health problems. Kelly is great! She took the time to listen to my concerns and answer my questions. I would highly recommend Kelly! Very understanding, friendly, and proactive. I've never had a male gyno before, but he immediately made me feel comfortable.